Skin color is a (very imperfect) proxy for white ancestry in African Americans and Hispanics. If racial and ethnic gaps in intelligence have a genetic component, we would expect lighter skinned individuals to have higher IQs, on the average. Further, because g is the main heritable component of intelligence, tests with higher g loadings should show larger associations with skin color. We investigated these hypotheses in the NLSY97 sample. It contains interviewer reports on facial skin tone of the respondents as measured on a scale of 1 (lightest) to 10 (darkest). The interviewers used a “color card” as a reference. All the correlations below are significant at conventional levels unless otherwise indicated. Because of the way skin color is coded in this analysis, negative correlations between skin color and test performance are expected if the hereditarian hypothesis is correct. Applying again the method of correlated vectors (MCV), we found that vectors of skin color-test gap correlations were strongly and significantly associated with g loadings within populations. In other words, lighter-skinned individuals tended to outscore darker-skinned coracials/coethnics more on tests with higher g loadings. Among blacks, the correlations were r=-0.84 and rho=-0.75, and among Hispanics r=-0.60 and rho=-0.59 (correcting for unreliability would make all these correlations somewhat stronger). The MCV results could be interpreted in terms of genetic effects: tests with higher g loadings are more heritable, and skin color is a proxy for white ancestry and thus presumably better “IQ genes”. But why would these within-population color analyses produce the expected correlations between g loadings and race markers (i.e., skin tone) when the between-population MCV analysis, presented in the previous post, did not? It appears that on the ASVAB g is the major source of racial/ethnic differences, but the T factor also contributes to the gaps. (Cohen’s d’s on the g scale were B-W 1.124, B-H 0.368, and H-W 0.759, while on the T scale they were B-W 0.561, B-H 0.261, and H-W 0.306.) However, T is not associated with skin color within populations, which suggests that its heritability is low and it is linked to race and ethnicity for non-genetic reasons. This would explain why the MCV results from within- and between-population analyses differ. In the NLSY97, higher g is associated with lighter skin among blacks and Hispanics. This is in accord with hereditarian theory, but nurturists would of course argue that these correlations are due to colorism. These competing hypotheses could be tested by comparing skin color-IQ associations within and between families, as was done here. A long-time reader and an occasional commenter (under various pseudonyms) in the “Steveosphere”, I’m making my debut as a blogger on these topics. My intention is to post both empirical analyses and more general pieces touching on human biodiversity. My professional background is not in psychometrics, genetics, or anything related. However, I believe that diligent amateurs can break new ground on these topics, as exemplified by John Fuerst’s work at Occidental Ascent. While HBD is thriving in academia in the form of research programs on individual differences, research on race differences is moribund. Amateurs will have to pick up the slack. Others have remarked that they cannot entirely disentangle their interest in HBD from their political views. This applies to me, too, and I think, probably naively, that hard-hitting discoveries in HBD could mitigate some of the more negative trends in Western society. But more on that later, perhaps. I can be contacted at mr_dalliard at hotmail dot com. According to Spearman’s hypothesis, black-white gaps on cognitive tests are larger on tests that are better measures of g, or general mental ability. If g is the only or main source of the black-white gap, it indicates that within- and between-race differences are qualitatively similar and that understanding the nature of the racial gap requires that we understand the nature of g.
One of the ways that the late Arthur Jensen used to test the hypothesis was the method of correlated vectors (MCV). It involves factor analyzing a battery of cognitive tests taken by a sample of individuals from different races, and correlating the resultant vector of g loadings with the magnitudes of racial differences on each subtest of the battery. 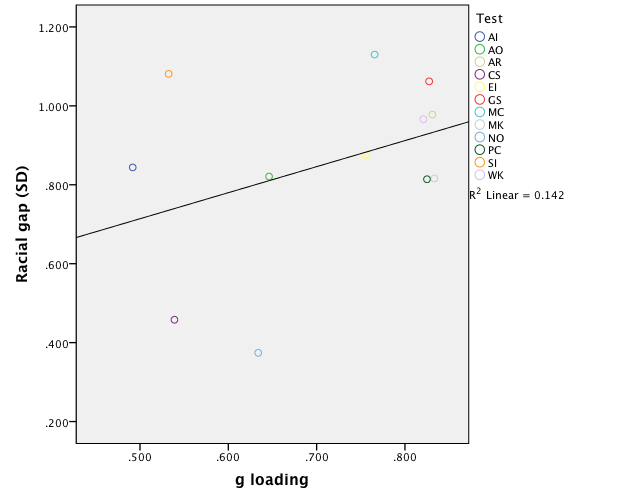 The expectation is that tests with higher g loadings are associated with larger racial gaps. Jensen did a number of analyses of this kind, and found that the average correlation between g loadings and subtest differences across many different samples of blacks and whites was 0.63 (after correction for unreliability), supporting the notion that g is the main source of the black-white gap. Analyses of Hispanic-white gaps have also generally supported the idea that g is their major source. The ASVAB is the Armed Services Vocational Aptitude Battery, so it contains also items that would not show up in a typical IQ test. I’ll call the second factor the T factor. Pearson’s r’s for white-black, black-Hispanic, and Hispanic-white comparisons were 0.38, 0.12, and 0.39, respectively, while the corresponding Spearman correlations were 0.14 (ns), 0.077 (ns), and 0.287 (ns). However, it could be that the expected correlations aren’t there because of confounding due to different reliabilities of the tests. However, controlling for reliabilities doesn’t substantially change the results (not shown here). In the black-Hispanic and Hispanic-white analyses the results are broadly similar, although the correlations are somewhat smaller and not always significant. 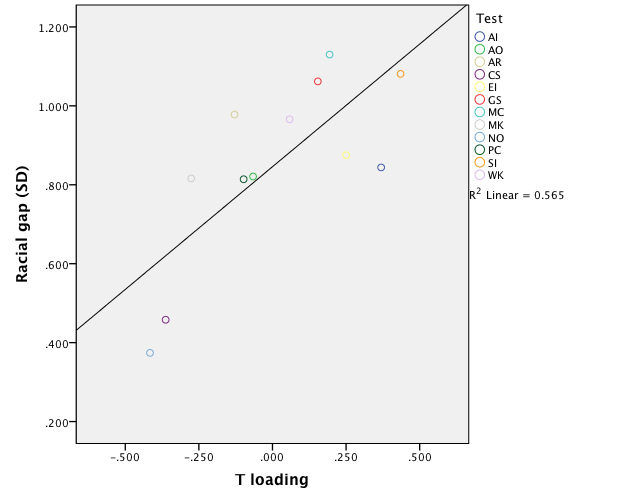 Thus the racial/ethnic gaps are not only not explained by differences in g loadings, but are in fact explained by loadings on the T factor which is uncorrelated with g! Does this mean that T and not g is the main source of racial/ethnic differences in ASVAB abilities? In fact, it does not indicate that, and these analyses only demonstrate the shortcomings of the MCV. As can be seen, partialling out g scores removes most of the gaps in all tests, while partialling out T scores has only a small effect. Thus g is the main source of cognitive differences between blacks and whites, while T is a minor source. For some reason, T is nevertheless a major source of differences between the relative sizes of gaps on different tests, which is why the MCV analysis fails. Multi-group confirmatory factor analysis appears to be a much better method for testing Spearman’s hypothesis. At the moment, that method is unfortunately beyond my skills and patience. In part 2 of this post I’m going to extend this analysis to differences in skin color. See here for John’s SPSS syntax for combining the ASVAB variables (there are two of them for each test), regressing out the effect of age on ASVAB scores, and performing a factor analysis on the ASVAB. Lynn’s international dataset lacks data for Haiti. The Global Bell Curve (2008) simply reports “Nothing is known of the intelligence of the population of Haiti” (p. 147). IQ and the Wealth of Nations (2002) estimates an IQ of 72 by regional comparison with Jamaica. IQ and Global Inequality (2006) estimates an IQ of 67 by comparison with Jamaica, St. Lucia, and Dominica. This is the estimated value still reported in Intelligence (2012). 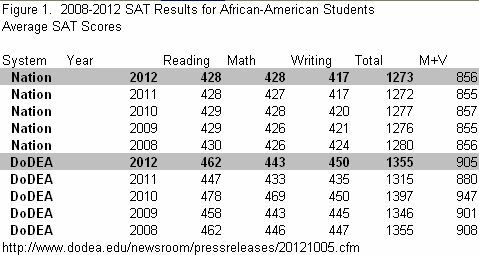 Figure 1 below shows the last five years of SAT scores for African Americans who were a part of the Department of Defense educational system (DoDEA) and for those who were not (Nation). The former, the children of enlisted personal, perform almost 0.3 standardized units better than the latter. Elsewhere, I have documented that this 0.3 difference can be found in DoD schools both in the US and abroad. I don’t know where to begin. If I have to introduce myself I could say that I’m chinese, that my english is awful, that no one knows who I am, and that the average reader of this blog is probably much older than me. Also, it is clear that Jason Malloy and John Fuerst have followed the IQ-race debate for many years now and I am not as knowledgeable as they are – far from it – but knowledgeable enough to write this. To be honest, around two years ago I didn’t even know that blacks have a lower cognitive ability than any other races, as assessed by IQ tests, until I came across this paper “Thirty Years of Research on Race Differences in Cognitive Ability” – in February/March 2011 if I remember correctly. This has caused a stir in my mind, and struck my curiosity. Since that day, I wanted to be better informed, collecting information and data that either reject or confirm the theory posited by the hereditarians. Gradually I was moving to the dark side. You could say I am a hereditarian now. Among all the books and papers I have read so far, I would highly recommend Arthur Jensen (e.g., The g Factor, Educability & Group Differences, Bias in Mental Testing). I think he is the one who has made the most devastating criticisms against the environmental-cultural hypothesis, and James Flynn being the toughest opponent of the hereditarian side. I am not particularly interested in the consequences of the victory of one side over the other, but if I have to say a word about my political view, which is not worth discussing, the only thing I would say is that no one (and even asians – at least those who live in western countries) would agree with me. I indeed see all the advantages of an ethnically homogeneous country, regardless of the tenability of the “race realism” thesis, which has become my new obsession. My goal in joining this blog is to pursue what I was constantly trying to succeed in for these two last years : refuting the race realism case. And I have not yet succeeded.